You can make a simple braided halter with tassel for a Traditional scale Breyer horse out of a few odds and ends you have around the house. This is a good beginner's project or children's project. You can make a play halter in an afternoon. If you don't know how to make a braid, you can still make the halter, leaving the threads unbraided and simply tying them off. 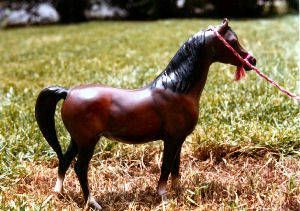 You can also easily scale this up for a large Marx brand model horse or down for other Breyer horses, such as the Classic Arabian family or the Paddock Pals and Stablemate Arabians. Gather your materials together before you start making this Arabian style play halter to fit a Breyer or other model horse. You may already have a skein of embroidery thread around the house. Use a color that looks nice with your horse model. A bright blue would look nice against a gray or white horse, while green might look good with a palomino or chestnut Arabian. Black and bay horses look beautiful with gold, silver or another bright color. A Breyer or other model horse. A vintage mahogany bay Breyer Proud Arabian Mare was used for the project photos here. Copyright 2011 by Jeanne Grunert. Used with permission. The first step in making your simple Arabian style model horse halter is to make a long rope-like braid out of the thread. This is what you will knot together to make your halter. Cut three lengths of embroidery thread about 12 inches long, keeping the strand six-ply. Typical embroidery thread is 6-ply, meaning it can be separated into six strands, but keep the strands together for each of the three lengths you need to braid together. Tie the three threads together, then insert the stick pin through the threads into the cardboard close to the knot at the top of the thread. Begin braiding. Braid it very tightly until you get to the end. If the braid gets lumpy, flatten it out or unwind it and start again. Keep the braid tight and flat! Make a knot at the end to tie it off. Take your Breyer or other horse model and the length of braided thread and hold the thread against the horse's nose, near the left nostril and on the side of the face. Bring the thread back gently up the side of the horse's head, behind the ears, and back around to the right nostril. Add at least a few centimeters of length to that, then make a knot in the thread. Clip the braid, holding the end together carefully. Knot the long piece so it stays braided. This short piece you just made will form the headstall of your Breyer horse halter. The noseband is the part of a horse's halter that fits over the nose. On this toy or play halter, you will tie it to the side pieces or headstall. Take your remaining piece of long braid and gently wrap it around the horse's nose, forming a loose circle. Tie the circle. Hold the end of the remaining braid tightly. Clip it off the circle. Tie the end again. Now tie the headstall piece on either side to the circle. Clip off any remaining thread. Now you will add a big tassel to the Arabian model horse halter. Take a length of embroidery thread from the skein and wrap it around the pencil. You may need to use two pencils to get it the size that you want it. Don't wrap it too tightly. When you've wrapped it several times around the pencil, over and on top of itself, clip the thread. Take a length of thread about four inches long and run it under the top of the bundle of thread on the pencil. Tie it as tightly as you can. Slip the scissors under the bottom of the thread bundle and snip it across. Use an extra piece of thread and tie it around the top of the tassel to finish it off. Now tie it to the noseband. You may want to use nail scissors or embroidery scissors to neaten the end of the tassel. Now you will use the rest of the braid that you made to make the lead rope to match your Arabian style model horse halter. Tie the lead rope under the chin to the noseband, near the tassel. In the photo of the bay Breyer Proud Arabian mare, the lead rope is stretched off camera and placed over the edge of the chair, but you can also stretch it off camera and wedge it under a few books to keep it the right height if you do not have a doll handler. To take your halter off, gently slip it over the model's ears.